Today, to make up for the recent lack of posts, we want to share with you one of the special moments from the Hobo production. As you might have seen in the trailer, there is a cut of a digger smashing a cardboard box into a bloody mess. The footage was shot outside of the production schedule, while we were trying out new ideas to add to the film. The box was rigged with all 60 gallons of leftover blood. We only had one take, so we set up two cameras and crossed our fingers. What happened was magnificent, we had two huge blood waves squirt out towards each camera in a veritable river of gore. It went absolutely perfect. The video below was shot right after Jason called the cut. Everyone is going wild because of how insanely well everything worked out. Most of the people you’ll see are close friends who helped make it happen. Needless to say, the best part of film-making for us is to get to these moments. What started out as a silly gag with a one in a million chance of working out turned into something completely unexpected, and a good impromptu party as well. Sometimes when I’m having a bad day I like to just take a few moments alone to think things through. Clear my head, you know? Well, Hobo’s the same way as you can see with today’s wallpaper. Enjoy a moment of Zen with him on your desktop. 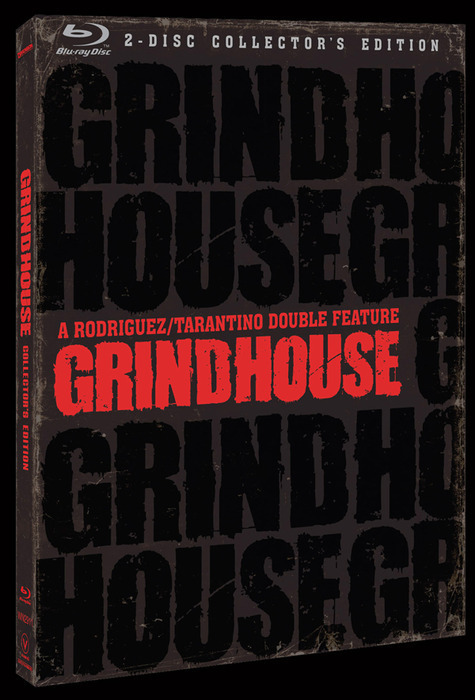 Just a heads up guys that today Grindhouse finally hit stores in its original form, the way most us all got to experience it in theatres. We’re very excited to let you guys know that on the special features of the Blu Ray edition, you’ll be able to view our original Hobo With a Shotgun trailer that won the Grindhouse trailer competition. I’ve had a chance to check out the Blu Ray, and it’s amazing. Wait till you see the extended trailer cuts for Rob Zombie’s “Werewolf Women of the SS” and Edgar Wright’s “Dont”. They’re beautiful.